FILE - Kenyan police take cover outside Garissa University College during an attack in Garissa, Kenya, April 2, 2015. Dulyladeyn, the al-Shabab terrorist sought for his role in planning the attack, was killed in an assault this month. It was very early on the morning of June 1 when a Toyota Land Cruiser Prado departed the Somali town of Bulogudud, 30 kilometers north of Kismayo. Almost immediately, two U.S. military helicopters came flying alongside the vehicle. The aircraft shone spotlights on the car and fired flares, an indication for the vehicle to stop and its occupants to surrender. According to regional and intelligence sources, four men got out of the car, but instead of surrendering they spread out and began firing at the helicopters. Somali commandos aboard the choppers fired back, killing all four. The troops then landed to make sure they had killed their target: Mohamed Mohamud Abdullahi, a man also known as Dulyadeyn, Kuno or Abu Fatuma, the name he was widely known by within his jihadist group, al-Shabab. Dulyadeyn, a Kenyan national of Somali ethnicity, was highly sought by the Somali government and its allies for his role in planning attacks inside Kenya, most notably the April 2, 2015, assault on Garissa University College in which 148 people were killed. Kenya had put a $200,000 bounty on his head. 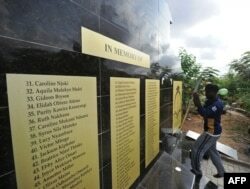 FILE - Workers mount a plaque at a memorial for the victims of last year's terrorist attack that killed 148 people at the campus of Garissa University College, April 2, 2016. “He caused big problems in Kenya. He recruited lots of men for al-Shabab, including Swahili speakers whom he then sent back across the border,” Fiqi said. U.S. and Somali intelligence agents had tracked Dulyadeyn for several days before the June 1 operation. Fiqi believes the intention was to capture him alive. “They tried, as we learned from the security agencies, to capture him but felt it was not possible to do that peacefully. Then the operation was executed and he was killed,” he said. African Union and Somali regional forces recovered the bodies, and Dulyadeyn’s remains were briefly displayed in Kismayo. “I could not recognize him because bullets destroyed his face. I only recognized his feet — he had long toes,” said a former member of Raskamboni militia, speaking on condition of anonymity. Dulyadeyn was a member of the militia before joining Islamist extremist group Hizbul Islam and, later, al-Shabab. The men who died with Dulyadeyn included a junior al-Shabab official identified as Farhan; Dulyadeyn’s nephew, who was his driver; and a bodyguard. Just four days earlier, a U.S. missile hit a car carrying Abdullahi Haji Daud, one of al-Shabab’s most senior military commanders. The U.S. had offered a $5 million reward for information on his whereabouts. Ma’alim Daud, as he was known, had held about every position in al-Shabab’s military and Amniyat, its security service in the region. Intelligence experts described him as a “war horse” just like Dulyadeyn. “They were similar. They believed the al-Shabab and al-Qaida doctrine. They were the backbone; they have been present from [the groups’] heydays, through their difficult time. They were the brains,” Fiqi said. He said Daud was in charge of “complex operations,” including the case of two French intelligence agents kidnapped in Mogadishu in 2009. One of those men was later killed after an unsuccessful French rescue attempt. Al-Shabab has lost several top leaders to U.S. airstrikes in recent years. The group’s longtime emir, Ahmed Godane, was killed in a September 2014 drone attack. “This is big setback for al-Shabab. They can find someone to replace them, but they can’t replace their experience, information, bravery and tough ideology,” Fiqi said.